When a holistic physician is murdered, Walt Williams takes the case. The 2005 film, “Kiss Kiss Bang Bang” starring Academy Award-winning actor, Robert Downey, Jr., based off the book “Bodies Are Where You Find Them” by author Brett Halliday was a hilarious take on the detective mystery genre. 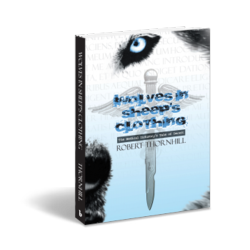 Author Robert Thornhill has taken a similar approach, penning his newest book, “Woves in Sheep’s Clothing” (published by Balboa Press), a dead-serious mystery, with hilarious twists sure to intrigue and entertain readers. Walt Williams is a 68 year-old rookie cop. When a holistic physician is murdered, Walt becomes entangled in the high-powered world of corporate giants and corrupt politicians. The Police Department and the FBI join forces, and Walt goes undercover in a 'sting' operation. In doing so he becomes the target of a vicious assassin. Walt is also a “rookie husband” and his new bride, Maggie, is determined to convert him from a life of comfort food and bachelor indulgence to a healthier lifestyle filled with organic food, vitamins, supplements and colon cleanses. Robert Thornhill began writing at the age of 66, and in two short years has penned six novels in the Lady Justice mystery/comedy series, the seven volume Rainbow Road series of chapter books for children, a cookbook and a mini-autobiography. Thornhill holds a master’s degree in psychology, but his wit and insight come from his varied occupations including 30 years as a real estate broker. He lives with his wife, Peg, in Independence, Missouri. Balboa Press, a division Hay House, Inc. – a leading provider in publishing products that specialize in self-help and the mind, body, and spirit genres. Through an alliance with indie book publishing leader Author Solutions, Inc., authors benefit from the leadership of Hay House Publishing and the speed-to-market advantages the self-publishing model. For more information, visit balboapress.com. To start publishing your book with Balboa Press, call 877-407-4847 today. For the latest, follow @balboapress on Twitter.